With the Windows 8 consumer preview rumored to be announced Feb. 29, Microsoft has given much thought into optimizing it to run well not just on desktops and laptops, but also on tablets and even smartphones. Part of making an operating system friendly for mobile devices is making it power-conscious, able to do everything you want while using as little power as possible. Earlier this week, Microsoft's Building Windows 8 blog detailed how Windows 8 will accomplish this. Here are five ways the OS is being optimized so your apps use less power and you can get more work done. If you’ve ever taken your laptop on a long flight hoping to get some work done, then you’ve probably gone through a traveler's ritual. To extend your battery life, you shut down all unneeded apps, and disable all the services running in your task or menu bar. In my experience, doing this can often extend your run time by 25 percent. Metro apps will use no power while running in the background . When you travel all day with your phone, you generally don’t need to do this. Phones and tablets have been designed with a closer eye on energy efficiency. Background apps are less likely to have an impact on your battery. Windows 8 will take a similar approach; if you can’t see the app, then it shouldn’t use power. 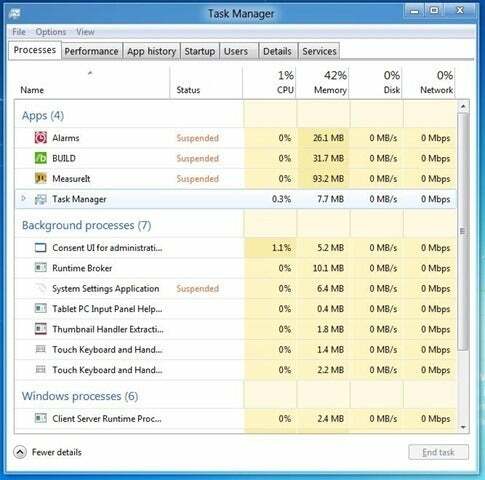 Desktop apps that you’re currently running on your work PC will still run as they always have, and besides some minor benefits due to operating system improvements, they'll use as much power as they have in the past. The Building Windows 8 blog details how Metro-style apps written for Windows 8, however, will have options to reduce their power footprint, extending battery life. Metro-style apps will be suspended when moved to the background, with the Windows Scheduler no longer giving them CPU cycles. The app is ready to work instantly when pulled to the foreground, but until then sits idle, using no power. Windows 8 includes APIs that allow Metro-style apps to complete these actions in the background in a way that is power-efficient. Metro apps can still run in connected standby. Phones and tablets rarely get turned off. Instead, they generally sit in a standby mode, using little power. Windows 8 accommodates this functionality by supporting a “Connected Standby” state on new hardware that supports it. A “Desktop Activity Moderator” will enable apps that otherwise only understand awake and sleep modes to work in connected standby mode. The moderator will allow select processes to run, while preventing unnecessary background tasks from draining your battery. Windows 8 is making a dramatic transformation from a desktop OS to a mobile OS. With over three-fourths of the PCs currently sold being battery-powered, the emphasis on power efficiency is well-placed. One thing that's apparent in seeing these new power-saving techniques is that much of the software your business currently uses will need to be rewritten to take advantage of these improvements. Running power-hungry desktop apps on a Windows 8 mobile device will make users quickly desire a Metro-style version to extend their devices' run time and increase the amount of work they can get done.